Wren Singer is on the lookout for students in need of advice. 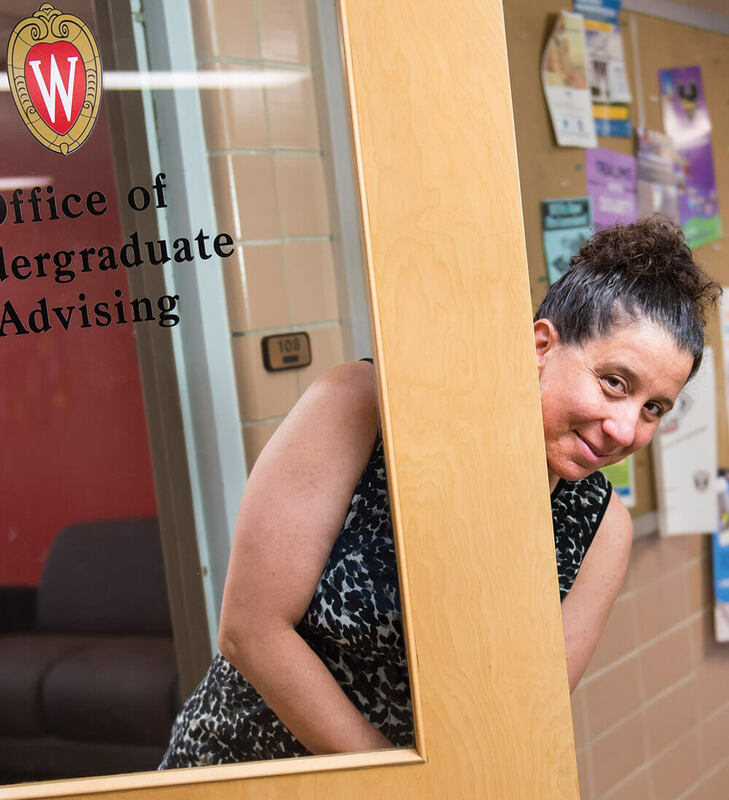 The Office of Undergraduate Advising aims to give better service. Photo: Jeff Miller. For many years, Badgers have gotten bad advice. Or at least that’s been the perception among undergraduates, who have consistently rated their satisfaction with UW advising services lower than their counterparts at comparable universities. 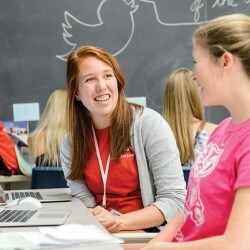 In 2011, the Office of Undergraduate Advising (OUA) was established to make some changes and serve as a centralized hub of resources for advisers across campus. Next year, the athletic department will donate the proceeds from the 2015 Wisconsin spring football game to those efforts. Among her many initiatives as the office’s director, Wren Singer ’93, MS’95, PhD’01 is pushing for simplified registration and course enrollment technologies. Why? She hopes advisers can shift from “transactions” with students about degree requirements to more holistic conversations. 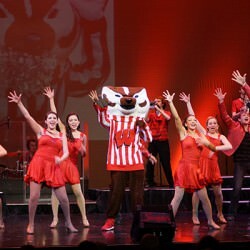 On Wisconsin talked with Singer about her vision of campus advisers becoming so much more than the folks who hand out major-declaration forms. What’s your ideal scenario in terms of how students make use of advisers? I want people to leave the university with their adviser as their main letter of reference, friend, and confidant, to look back and say, “If it hadn’t been for this person, I wouldn’t have gotten as much out of my education.” We need students to understand that in order to be successful when they graduate from college, they need to put together a package of experiences that includes courses and academic work, jobs and internships, and leadership and study abroad — all of these different things. That’s why you come to a big university like this, to have these experiences. And the adviser is the person who helps you work through all that, and someone you can talk to when you’re freaking out [because] your parents want you to be an engineer and you don’t, or your parents want you to be an artist and you want to be an engineer. And we’re a ways away from that in a lot of ways, but I think we now have the tools and the organizational structure to be able to get there. Do students have expectations about advisers that are different from what their older siblings or parents had? I’m not sure they are thinking about [advisers] differently, and they need to, because what they need to accomplish in college is so much more than what it used to be. A really long time ago, you just graduated and got a job. The university didn’t have any particular responsibility to make sure that happened, because it just happened. But students now need [to do] a lot more during their college experience to be marketable and qualified for jobs and graduate school. Universities are under more and more pressure to deliver students into careers in ways that ten, twenty years ago were more the employers’ responsibility. Many of our readers are parents of current UW students. What advice would you give them about helping their children navigate campus resources? 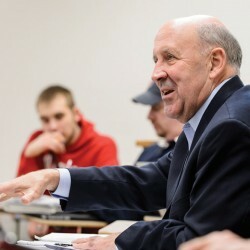 Right now, students get a lot of advice [about selecting a major and specific courses] from their parents, which is not being countered or supported by professionally prepared staff who understand the whole picture. If you’ve gone to school here yourself and now your children are going here, you can’t do their academic advising, because things have changed. It’s very dangerous when parents start getting involved and saying, “Here’s what you should take and what you shouldn’t take,” because they can be flat-out wrong. So they need to be willing to trust the professionals who are aware of the current rules. What do you wish your college adviser had told you? I never went to see a college adviser. I remember saying to myself, “Well, what do I need an adviser for? I can figure this out.” What I missed was the fact that English wasn’t the right major for me. If I had had a conversation with someone who could point out that I had As in all my other classes and Bs in all my English classes, that someone could have said to me, “What’s going on with that? Is this really a good major for you?” And I would have said, “No, I can’t stand it.” But I didn’t think that was something I could talk to someone about. I was embarrassed to ask for help. You could ask any alum that question, and they’d have something to say about it. They’d say they wished they’d had this, that, or the other thing. And now we’re trying, for their children, to do [advising] differently.